That is the motto of the recently rejuvenated Thomas & Thomas rod company. “By the time you’ve bought everyone else’s rod, you’ll say, ‘I really want a Thomas & Thomas’,” says owner Neville Orsmond. Once you take a look into the history of this prestigious company, you’ll want one too. It’s a 2 hour drive from Boston to the Thomas & Thomas factory in Greenfield, Massachusetts. About an hour and half in, you’ll feel the urge to trout fish. The T&T headquarters are situated between Miller’s River, the Deerfield, and the Connecticut River – giving the staff ample opportunity to test out rods on all different sorts of water. The roads around Greenfield hug the rivers and creeks, and you’ll be leering over bridges to get a better look. The landscape practically screams “make fly rods here”, which is what Thomas & Thomas has been doing for over four decades. Thomas & Thomas was established in 1969 by Thomas Dorsey and Thomas Maxwell. The two legendary rod makers worked side by side, producing what was regarded as the highest quality hand-crafted fly rods on the market. Particularly known for their signature bamboo rods, a pair of trout rods was gifted by the President Reagan to Prince Charles and Lady Diana on their wedding day. The royal thank you note now hangs in the Greenfield showroom. Thomas & Thomas is known for this sort of prestige. Jimmy Kimmel just ordered one for Christmas and Eric Clapton re-ups on the new models every year. One time, Prime Minister Malcolm Fraser of Australia was late to a meeting because he was having so much fun casting a T&T rod on the White House lawn. He was so enamored with the rods that he paid a visit to the T&T factory after leaving DC. However illustrious the history of T&T, by 2010 the esteemed rod builders were in a struggle of sorts. South African businessman and passionate fly fisherman Neville Orsmond, who had long admired the company from afar, arrived at the Greenfield plant in 2013 to personally order some rods. What he found was an iconic company on the verge of bankruptcy and an opportunity of a lifetime. Neville grew up in South Africa, where the ultimate rod to have was a Hardy. “Probably because of the English stronghold in South Africa,” he says “and then Thomas & Thomas came around and they made unbelievable rods. I started buying Thomas & Thomas rods because I just loved what the company stands for.” A few decades later, he never would have expected to be buying the company as well. When Neville showed up in 2013, Thomas & Thomas had fallen into a rut and was in desperate need of leadership. He re-energized the staff, made crucial investments in infrastructure, and shifted focus towards customer service – an area which had floundered at T&T. “It’s important that we have a personal connection with each client, to deal with each client individually,” says pro ambassador and world renowned guide Jako Lucas. An email to the pro staff will get answered almost immediately, and the turn around time on a rod repair is lightning quick. This hands-on approach allows T&T to source feedback and garner long term relationships with valued customers who appreciate the American roots of the Thomas & Thomas brand. Once again, the Thomas & Thomas brand was being operated by those who truly love the sport of fly fishing. “We are all fly fishermen. This is what we love and dream of doing and we all get so excited if it’s another rod, another picture, another movie that we’re trying to get made. We all live for this, we can relate to everybody else,” says Neville. Throughout T&T’s 50 year history, every rod they’ve ever produced has been handmade in the United States. Not one blank has ever been imported, nor any of the materials used in production. Even the graphite is American. None of the major rod companies are doing this nowadays, which is why so many are rooting for T&T’s triumphant return to the fly rod market. Admittedly, a product made entirely in the USA is more expensive, but the artisanal quality of a T&T rod is something that consumers are willing to pay for. “It’s a hand made product that’s not mass produced off some assembly line,” says long time Thomas & Thomas employee John Carpenter, “you can really feel the soul of the craftsman in the rod”. Thomas & Thomas has also put a renewed emphasis on conservation and education. “We need to be the guys who are on the forefront of environmental protection. That’s number one,” says Neville, speaking not only about T&T but about fly fishermen in general, “what really matters is the whole mentality of preserving nature and teaching young people how to look after what we have”. Thomas & Thomas was well known amongst the older generation of fly fishermen, but wasn’t widely recognized by the new generation we see on the water today. To get younger people excited about the sport and T&T rods, the company has recruited an impressive roster of pro athletes who continuously give feedback on the rods and market the company, including Jako Lucas and Rebekka Redd. These athletes travel the world and put Thomas & Thomas products to the test against all sorts of fish, from bumphead parrotfish to arctic grayling. Alphonse Fishing Co. and Yellowdog Fly Fishing now exclusively provide Thomas & Thomas rods for their clients. 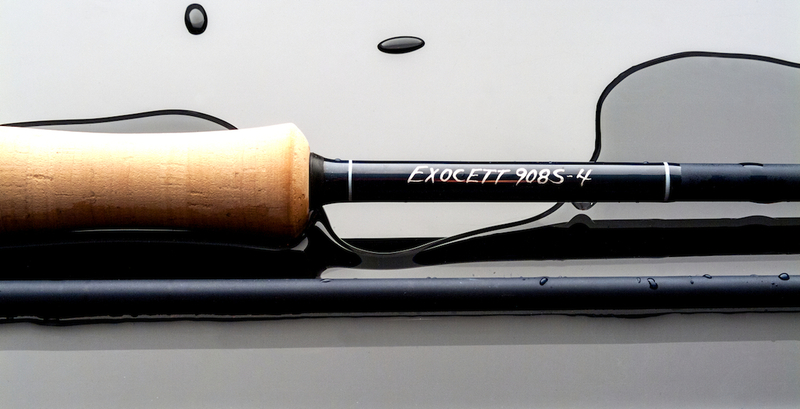 The latest example of Thomas & Thomas’s rod making prowess is the saltwater Exocett series. The name “Exocett” comes from the scientific name for flying fish. “Whenever you see flying fish in the air it means there are big fish around” says Neville, “so we thought it was the perfect name for the saltwater series.” The 9′ rods are available in a 6 wt all the way up to a 12 for fighting big fish like giant trevally and tarpon. The Exocett is a beautiful rod, with a matte blue finish that really sets it apart. The sweet spot is one of the biggest we’ve ever experienced. It makes a double haul an absolute pleasure. In the next few months, Thomas & Thomas plans to unveil their new take on fiberglass rods and have plans to adapt that into a trout spey. Check in with Thomas & Thomas below and stay tuned for updates on this great company. See more from Thomas & Thomas.